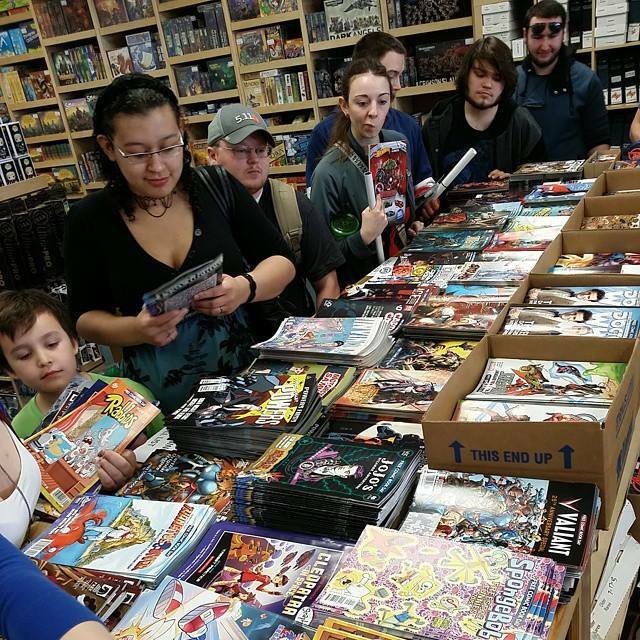 Nerds of all shapes, sizes, and colors love their local game or comic store. For most of our geeky lives, our friendly local game shop has been our third space, coming right after home and work. Not only is the stuff we love to buy located in game and comics shops, but we have friends in those shops as well. Nerd culture doesn’t exist in its current magnificent form without the presence of game and comic shops! 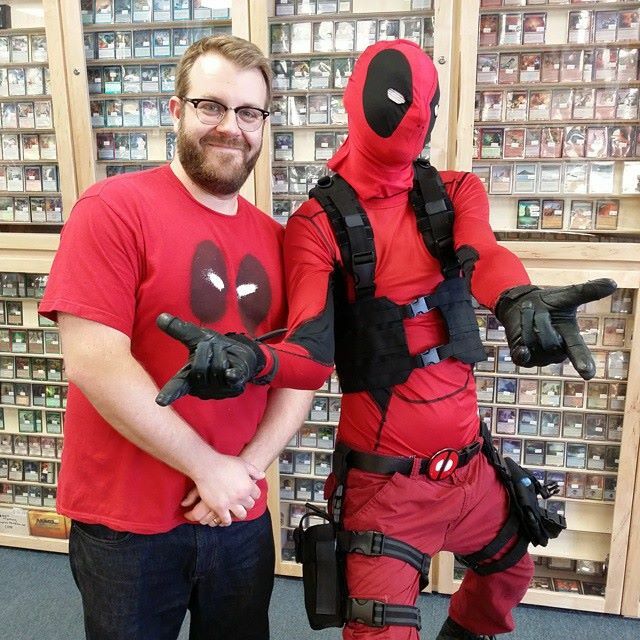 So we interviewed Tony Leitner, co-owner of Level Up Games in St. Paul. MN. Wherever in the world your favorite game or comic shop is located, it’s fun to get a little behind the scenes peek at what makes a game shop great. CLAVE: Tony, first of all, tell us who you are. Being the boss, you can choose any title you want, so did you go with “Tony, Devourer of Worlds!” or did you stick with something a little more professional? Second, what’s your origin story? TONY: I’m a father, a husband, and a small business owner. I’ve also been a gamer my whole life. Most people just call me Lites since my last name is Leitner, and my origin story is this: I have always loved games and comics. Some of my earliest memories are with my family huddled around the Atari 800 XE, playing classics like Pac-Man and Pitfall. I remember my first time playing Mario on the NES, my first time playing Heroes Quest and my first time rolling a “20” and killing a dragon. One summer day in 2009, we checked out a garage sale, and hit the jackpot. From there, we decided to start an online game store though eBay, not thinking much about where it might lead us, but we did well and decided to continue to hit up local garage sales once a week, just for fun. Before we knew it we had so much inventory that we needed to move it from my bedroom in our small house to an actual retail location. That is how Level Up Games was born. CLAVE: Whoa, so you went from garage sell hopping to opening your own game shop? That’s cool. And you are even expanding, right? What’s the purpose of the expanded space? New product lines or more gaming space? TONY: The expanded space will be used to add more sales floor as well as doubling the size of the play space. Currently, when we have large or multiple events on the same night, we can’t accommodate those customers who are just dropping in who would like to participate. We are hoping this expansion will allow for every one who would like to play to do so. We will be adding to the number of tables dedicated to RPG and tabletop gaming, along with introducing several new product lines. Two of the largest categories that will be expanded is Warhammer (doubling our play space) and adding hundreds of new board games. CLAVE: I’m assuming you don’t buy your inventory via garage sells now! How do you make your decisions about what products to carry? Is the alchemy influenced by market trends, customer feedback, distributor or manufacturer deals, or simply what you guys like? TONY: We buy all our used inventory from customer trade-ins. For new inventory, we listen to our community, research top lists and hot/coming soon lists, talk to our sales reps through various distributors about whats doing well in the market, and of course we sprinkle in things we like or just think sounds cool or fun. Finally, we might check out Youtube and other online shows, like Tabletop with Wil Wheaton. CLAVE: Level Up has such a welcoming and friendly vibe to it. I don’t think there has ever been a time I wasn’t greeted warmly when I walked through the doors. Is friendliness a value you want Level Up to be about? TONY: It is very important to us. I had the opposite experience when I was growing up and visiting game/comic stores (employees never greeting you, being rude, etc. ), so when we opened Level Up, we never wanted our customers to feel that way. All our employees are trained on providing excellent customer service. People are more important than sales/money and we will always feel this way. We are currently working on expanding our current location. This all happened because of our customers. CLAVE: So do you want Level Up to be known for its customer service? TONY: Our customers are the most important people in the world to us. Without them, Level Up Games would not exist. I will be eternally grateful that people choose to spend their hard earned money in our store. We treat our customers with respect and kindness, and we want each and every person that walks through our doors to feel that they belong. We want to continue to provide they type of customer service where people feel welcomed – a place they want to come back to because they had a such a great experience. It still humbles me to this day. I never thought I would have owned a game store, not to mention calling it my career. It began as just a cool thing on the side for gamers to call home. But thanks to the support and loyalty of our amazing customers both myself and Tony Hoagland are able to work full time at the shop and do something we love each and every day. CLAVE: So that explains the expansion of gaming space in your shop. 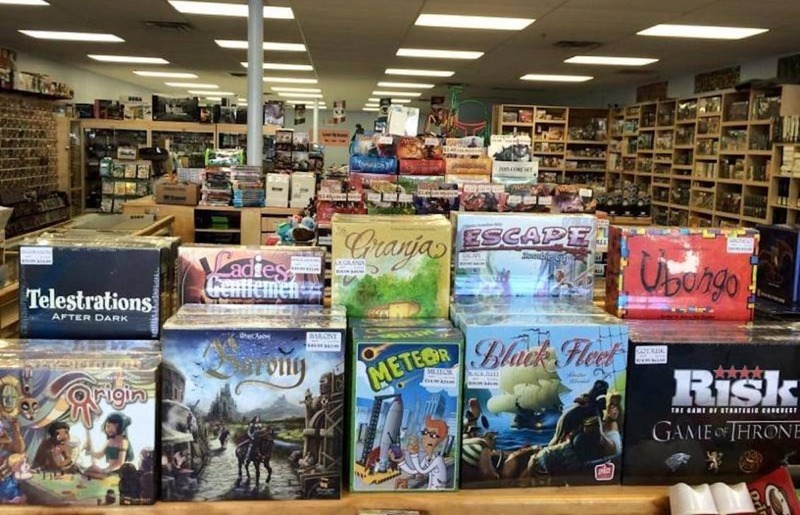 Even though Nerds on Earth is online, we’re very much of the belief that nerd culture is a product of face-to-face connections, many hosted by game shops. So thank you for providing that locally for gamers. TONY: Gaming space is everything to us. Our whole business model from day one was to bring the social aspect back into gaming. 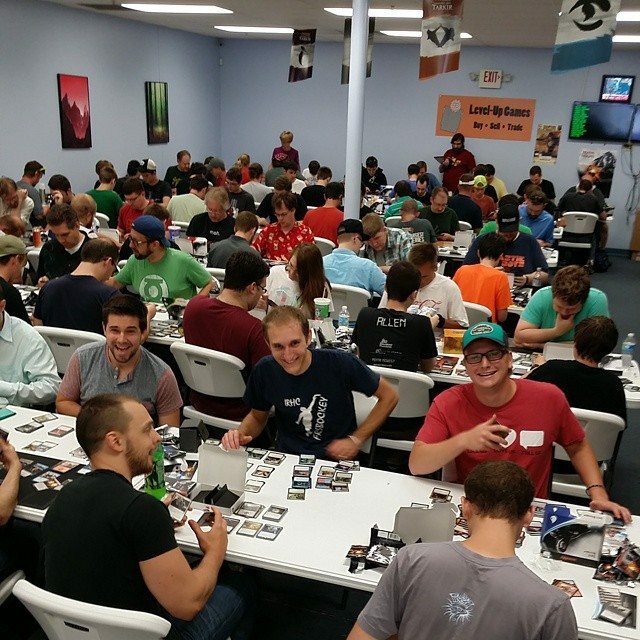 Whether it’s having nightly board and card game events or holding video game tourneys in store, getting the players to interact with one another is one of the greatest things. It creates friendships, a sense of competition, and is just overall fun. Our store is all about community, and we work hard to see that value come through. We want everyone to know each other and to always feel like they belong. CLAVE: Tony, congrats on the success of your store and good luck with the expansion. Most all of, thanks so much for for your impact in making comic and gaming shops be places where community is built, and let’s hope that’s an ideal that’s spread far beyond Level Up Games. Readers, if you are in the Minneapolis / St. Paul area, DO YOURSELF A FAVOR and look up Level Up Games. Level Up has a sweet classic gaming section in the shop, including some old school Nintendo NES titles I’ve been eyeballing. BTW, thanks for special ordering the Pathfinder Battles minis for me, Tony. Level Up carries a full line of D&D and Pathfinder, minis, tons of board games, Magic and other CCGs, X-Wing, used video games, new release comics and so much more, all at very competitive prices! 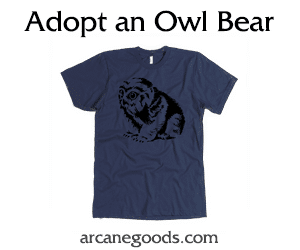 They have something for nerds of every stripe. And they are inclusive. Check it: Level Up Ladies Club. Thanks for reading. If you’ve enjoyed Nerds on Earth, please do us a solid and spread the word via the social media buttons just below.